Wedge these durable, acrylic wine glasses in the ground, sand, or snow for elegant outdoor sipping. There's no quicker way to kill the magic of a beach sunset or picnic in the park than by sipping from a flimsy plastic cup. 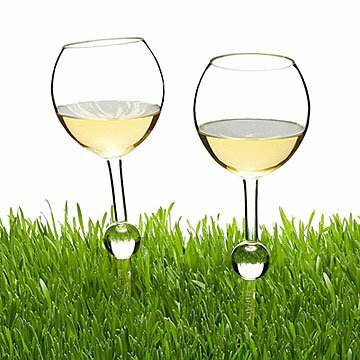 Bring back the romance of drinking from a proper wine glass with these grass-, sand-, and snow-friendly sippers made of durable acrylic. Just wedge the stem into any terrain, or even set it afloat in water to enjoy a spill-free, unbreakable experience. Made of BPA-free acrylic in Taiwan. Finally a stemmed wine glass that works outdoors! Now there's no worry about setting a wine glass down on unstable surfaces outdoors! This is perfect for the beach, outdoor concerts, or picnics in the park. This was a gift for my father & step-mother. They enjoy wine and now have glasses they can use when sitting on the front lawn or at the beach. Given to active millennial couples; they loved these glasses! Some frequently go to beach houses and one couple has a pool at home, so everyone looks forward to using them.